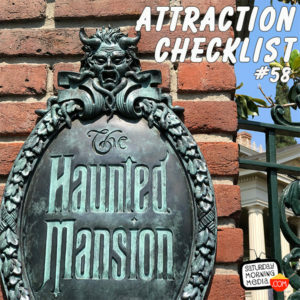 http://www.attractionchecklist.com – Foolish Mortals! It’s time to head to Disneyland and experience the classic attraction that is The Haunted Mansion! Join John B. deHaasand I as we ride and review this Disneyland icon! Recorded on July 27, 2018. This episode we head to Disneyland to ride one of the all time iconic attractions, The Haunted Mansion. There is no longer a description for this attraction in the guide map, but the Disneyland website says, “Embark on a hair-raising tour through a creepy haunted estate, home to ghosts, ghouls and supernatural surprises.” There are no height requirements on this attraction and Fastpass is available. The thrill level describes this attraction as being Slow, Dark, Loud and Scary! Before we visit this 999 happy haunts, here are 5 fast facts about Disneyland’s The Haunted Mansion. 1. The Hunted Mansion opened its doors to guests for the first time on August 9, 1969. 2. Although the Haunted Mansion resides in Disneyland’s New Orlean’s Square, the inspiration for the mansion came from The Shipley-Lydecker House which was located in Baltimore, Maryland. 3. The voice of Madame Leota, the mystical head inside the crystal ball was provided by voice actress Eleanor Audley who also provided the voices of Maleficent in Sleeping Beauty and the Wicked Stepmother in Cinderella. 4. Did you know that the three hitchhiking ghosts at the end of the attraction all have names? The short one with the ball and chain is Gus, the tall one is Ezra and the one carrying the carpet bag is Phineas. 5. On April 10, 2015, it was announced that The Hatbox Ghost would be returning to Disneyland’s Haunted Mansion. The Hatbox Ghost was an opening day spirit who was removed shortly after opening because his effect did not work as well as Imagineers had hoped. With new technology, he returned to the Haunted Mansion on May 9, 2015. Let’s now ride Disneyland’s Haunted Mansion. Joining me today is John B. deHaas and after we ride we will discuss our thoughts on this classic attraction. This is a binaural recording so if you have headphones put them on now as we are about to experience Disneyland’s Haunted Mansion.